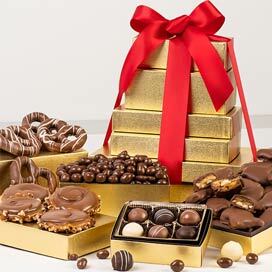 Delight everyone with this regal assortment of Southern sweets, packaged in elegant, paisley red and gold gift boxes, topped off with a hand tied bow. 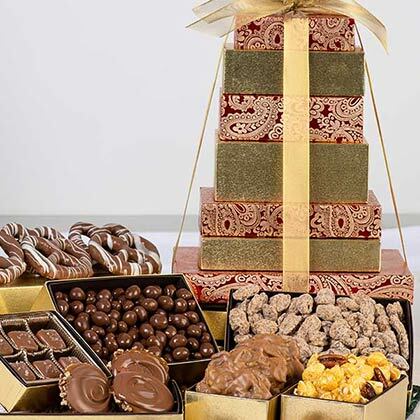 This lovely gift is packed with Savannah's Orignal Pralines, Milk Chocolate Gophers, Sea Salt Caramels, Praline Pecans, Milk Chocolate Covered Pretzels with a White Chocolate Drizzle, and Chocolate Covered Peanuts. I sent the Davenport 7 Story gift tower to my mother as a birthday gift. She LOVES IT! I think she is working on the third level. 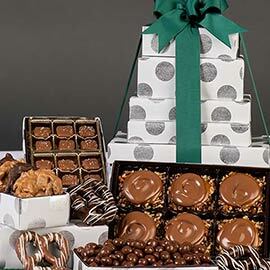 Thanks for producing an excellent and delicious gift idea to make my mothers birthday special. Mom loved the gift Tower so much she left it for several days just to admire it. She also saved the gorgeous ribbon. Mom loved all the candy, especially the sugar coated peanuts. Love using this service and to provide a taste of Savannah to family and friends. For Mother's Day very convenient by being able to provide in one order a gift for my Mother, Step Mother and My Mother-n-law with deliveries to their different addresses. You guys are on it! I've been ordering from Savannah's Candy Kitchen for years and find that their product and services are both quite exceptional. I have also had the opportunity to visit their store in Savannah and it was a wonderful experience for both myself and my wife. Thank you Candy Kitchen for making life more enjoyable.